Schach DVD A strategic weapon against 1.d4: The Queen's Indian Defense | Videolektionen | Eröffnung | Training | ChessBase | Schachversand Huber - Spielen Sie eine Partie Schach ! 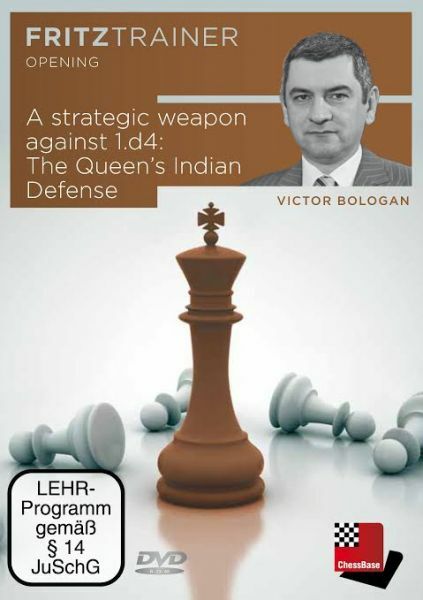 Produktinformationen "Schach DVD A strategic weapon against 1.d4: The Queen's Indian Defense"
The Queen’s Indian Defense is one of the most solid and rich openings against 1.d4. Together with the Nimzo-Indian and the Catalan it forms the so called “Classical Setup”, which any player should know. The Queen’s Indian is a favorite of both top players and amateurs. Top players like the solid structure of Black’s set-up that offers a lot of scope for interesting play and new ideas, amateurs like that the variation is easy to learn and understanding the position is more important than memorizing lines. Victor Bologan has enjoyed the advantages of the Queen’s Indian defense for many years in open and in top tournament. He says: “The soul of the opening, the most important piece, is course the bishop on b7. Please remember this and keep it active.” Every chess enthusiast, from beginner to high level player, can profit from this DVD. Enrich your chess vocabulary, be open to new ideas: play the Queen’s Indian! Victor Bologan is a pupil of the top Moldovan trainer Vecheslav Chebanenko. For many years Bologan has been the number one in Moldova and has represented his country in ten Chess Olympiads. He has won over 50 international events. His greatest successes were in 2003, when he first won the Aeroflot Open and then the famous Dortmund Tournament, ahead of Kramnik and Anand. Bologan has extensive experience as a trainer and has also published five chess books and 19 ChessBase DVDs. Kundenbewertungen für "Schach DVD A strategic weapon against 1.d4: The Queen's Indian Defense"